The hunting tradition in France goes back at least two thousand years, and probably more. Cave paintings depicting hunting scenes have been found here that date to prehistoric times, and in more recent history, la chasse was one of the major pastimes of royalty. Today, hunting in France can be enjoyed by sportsmen from around the world. One of the largest countries in Europe, France still has sprawling forested areas, fields, and mountain ranges that are home to red deer, fallow deer, roe deer, wild boar, mouflon, alpine chamois, and Pyrenean chamois. As in much of Europe, game is managed by professional gamekeepers, primarily on private estates. In addition to big game, driven pheasant shoots as well as walk-up hunts for pigeons, partridge, and ducks are popular. Good management and habitat improvement has led to an increase in most of France’s game populations in recent years. France is Europe’s primary tourist destination, with plenty to offer in the way of food and wine as well as art and culture, so a hunt in France can easily be combined with a family vacation, wine tasting, or sightseeing. Holders of passports from the EU, USA, Canada, and many other countries do not require a visa for a tourist visit to France. 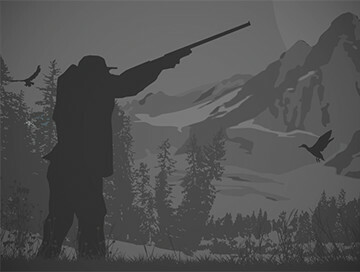 All hunters must have a French Hunting Permit and valid insurance covering the duration and territory of the hunt. Most outfitters can organize these in advance of the hunt. 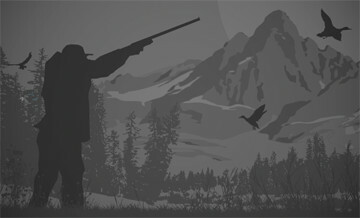 Hunters may bring their own firearms, up to two per hunter; however, you must apply in advance for a temporary import permit (for hunters from EU countries, and EU Firearms Permit is required). Contact the French consulate in your country to complete the necessary forms, or discuss the procedure with your outfitter upon booking. Be sure to declare your firearm to customs upon arrival to obtain an authorization. Most big-game hunting is done by spot-and-stalk or from a high seat, although boars and other game are often taken on drives. Most hunters in France use calibers in the .270 Winchester to .300 Winchester class, equipped with a variable-power scope. Shotguns with slugs are often used on drives. Traditional green or brown hunting clothing is preferred. Between November and February, warm, waterproof clothing is required. If a driven hunt is on the agenda, fluorescent vests are required; check with your outfitter to find out if these are provided. Export documents and veterinary inspections must be conducted on all trophies by a local taxidermist or export agent. Once this is completed, the trophies should be transferred by the taxidermist or outfitter to a customs broker for shipment, and an invoice will be sent to you. This is a guided hunt with Fallow deer trophy included - no size charges, you can harvest the best possible! The hunt can be done by stalking or from high seat. Daily rates include guiding, accomodation, and meals. Side tours that can be organized include visits to the most prestigious champagne cellars and a meal in one of the best restaurants in the world (5th in the ranking) which owners are our friends.